Are you looking for a new and exciting online slot game that’ll rejuvenate and make-over your online slot playing experience? 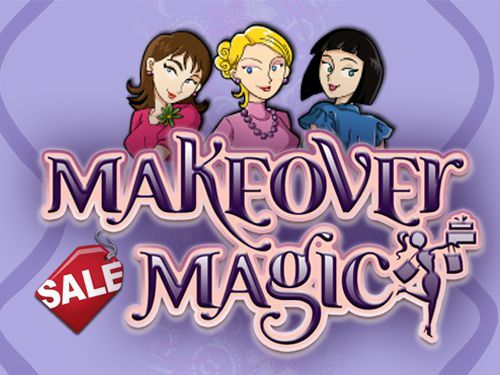 If so, then Make-over magic is the game for you. Pamper and preen your way across this spectacular 5 reel filled with 25 paylines and some friendly girlfriends from the city. Eyecon pride themselves on their outline when it comes to being the best slot-game maker out there. Their outline tells us that they are passionate about bringing online slot games to mobile platforms meaning they can be played everywhere and anywhere. Quite the transition from some of its other titles, Eyecon have brought something fresh, vibrant, and colorful to the tables with Makeover Magic. This simply highlights the developer’s determination to include everybody, so that everyone’s interests are considered for all to have a go at the Casino world. 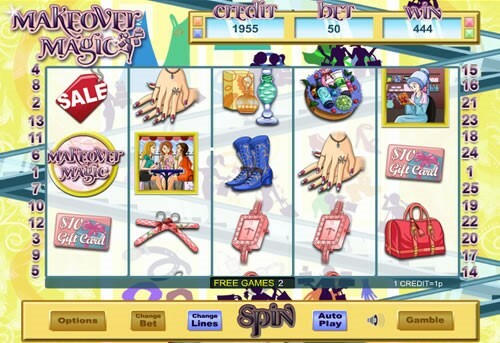 Shop ‘til you drop – or in this case, spin ‘til you drop in this fun shopping themed slot-game! This game guarantees it will not lighten your purse half as much if you had gone on a shopping spree. With just 1p to 50p max per spin, leave the purse behind, and enjoy the glamour and glitz in the comfort of your own home. The game is set out as a 5 reel, with 25 pay-lines to shop for! Luckily, you will not be overwhelmed with the purchases you could buy as there are 5 characters who will become your new retail therapy friends: Vanessa, Sandra, Chloe, Daphne, and Michelle. Matching 3 or more of the same girl will offer you cash prizes, as will other shopping-related symbols. These include a jewel-encrusted watch, makeup, a hamper of beauty products, a pair of boots, a handbag, a hanger, a manicured hand, a gift card, and a sale tag. There is also a café scatter symbol which will provide you with a free spins bonus round. 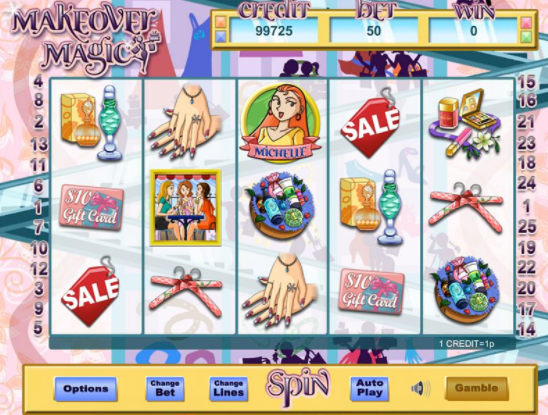 The wildcard is the Makeover Magic logo and this card replaces all other symbols on the reels to be part of winning combinations, but as a rule, as you will have seen in other casino games, it does not replace the scatters. There is also a prize picking feature where you can win 100x your total bet for the spin – imagine the number of clothes or makeup you could get, with a win like that! To add to these bonus features, a 5 of a kind Makeup winning combination of an active pay-line will award you the top prize of 5000 credits. Discover another excellent slots play and start spinning. With just a 1p starting point per spin, you are certainly not going to break the bank by any means but the winning possibilities are endless. This slot-game is the only place where going to a shopping center has the potential to increase your bank balance, so loosen those purse strings. Then you can spend your winnings on a real shopping spree – think about that! If you enjoyed Make Over Magic you might also like to visit Easyslots.com. Join today and learn how to deposit at Easy Slots.